As you can see from the painting above, the Pharisee Nicodemus came to Jesus at night (John 3:2). The night, illuminating in its own unique way, will reveal to Nicodemus things that had escaped his attention during the busy day. After all, Jesus is the light of the world (John 8:12), and the “true Light which…enlightens every man” (John 1:9). But the darkness also symbolizes Nicodemus’ fear and ignorance. 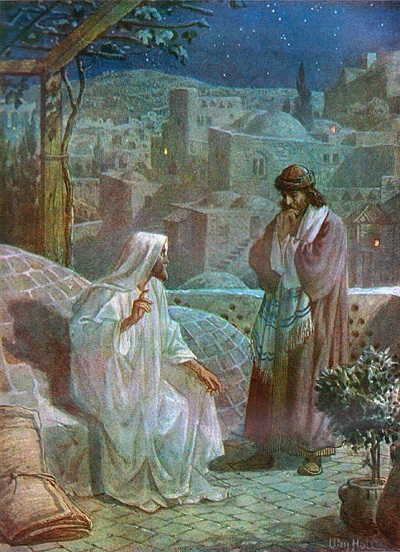 Nicodemus came to Jesus under the cover of night for fear of being seen by his fellow Pharisees. And Nicodemus’ ignorance – his being in the dark – is seen by his inability to see that Jesus is not talking about a physical rebirth but a spiritual one. In the “dark night” that spiritual writers talk about enlightenment doesn’t come all at once – no, such illumination is preceded by trials and tribulations, by misunderstandings, and by humiliations of the worst kind. Nevertheless, the scriptures attest that “surely the darkness shall hide me, and night shall be my light” (Psalm 139:11), and from “the recesses of the darkness he discloses, and brings the gloom forth to the light” (Job 13:22). In the physical darkness Nicodemus’ own darkness and ignorance is exposed by Jesus, and all of this is nothing short of “sheer grace” for Nicodemus, who will no doubt ponder and reflect deeply on Jesus’ words. “The Greek expression can mean either ‘again’ or ‘from above’. Nicodemus takes it to mean ‘again’, as though Jesus requires a physical rebirth to enter the kingdom. This is a misunderstanding. Jesus instead calls for a spiritual rebirth ‘from above’ (CCC 526). The Greek expression always means ‘from above’ elsewhere in John ( see 3:31; 19:11, 23).” (Ignatius Catholic Study Bible). “Through baptism we have already received the seed of eternal life, for through it we received sanctifying grace which is the radical principle of that life….” (Father Garrigou-Lagrange). In conclusion, to be born again means to be born from above in the birth of water and the Holy Spirit which is brought about in the sacrament of baptism. But what happened to Nicodemus? Did his “dark night” ultimately deepen his understanding and lead to his conversion? The Gospel of John tells us that after Jesus had died “Nicodemus…who had first come to him by night, came bringing a mixture of myrrh and aloes, about a hundred pounds’ weight. They [Jospeh of Arimathea and Nicodemus] took the body of Jesus, and bound it in linen cloths with the spices, as is the burial custom of the Jews.” John further tells us by implication that it was still light out because the Sabbath (sundown Friday) was “close at hand,” so that Joseph of Arimathea and Nicodemus laid Jesus’ body in a garden “in a new tomb where no one had ever been laid” (see John 19: 38-41). If, at the beginning of John’s Gospel we encounter Nicodemus in the darkness of night (Chapter 3), by the end of the gospel we find him walking in the light, carrying the blessed body of Jesus (Chapter 19), and lovingly placing it in the tomb of resurrection.